Modulation of the immune system is one of the most plausible mechanisms underlying the beneficial effects of probiotic bacteria on human health. Presently, the specific probiotic cell products responsible for immunomodulation are largely unknown. In this study, the genetic and phenotypic diversity of strains of the Lactobacillus plantarum species were investigated to identify genes of L. plantarum with the potential to influence the amounts of cytokines interleukin 10 (IL-10) and IL-12 and the ratio of IL-10/IL-12 produced by peripheral blood mononuclear cells (PBMCs). A total of 42 Lactobacillus plantarum strains isolated from diverse environmental and human sources were evaluated for their capacity to stimulate cytokine production in PBMCs. The L. plantarum strains induced the secretion of the anti-inflammatory cytokine IL-10 over an average 14-fold range and secretion of the pro-inflammatory cytokine IL-12 over an average 16-fold range. Comparisons of the strain-specific cytokine responses of PBMCs to comparative genome hybridization profiles obtained with L. plantarum WCFS1 DNA microarrays (also termed gene-trait matching) resulted in the identification of 6 candidate genetic loci with immunomodulatory capacities. These loci included genes encoding an N-acetyl-glucosamine/galactosamine phosphotransferase system, the LamBDCA quorum sensing system, and components of the plantaricin (bacteriocin) biosynthesis and transport pathway. Deletion of these genes in L. plantarum WCFS1 resulted in growth phase-dependent changes in the PBMC IL-10 and IL-12 cytokine profiles compared with wild-type cells. The altered PBMC cytokine profiles obtained with the L. plantarum WCFS1 mutants were in good agreement with the predictions made by gene-trait matching for the 42 L. plantarum strains. This study therefore resulted in the identification of genes present in certain strains of L. plantarum which might be responsible for the stimulation of anti- or pro-inflammatory immune responses in the gut. Metagenomics and host-microbe molecular interaction studies are rapidly expanding our understanding of the indigenous gut microbiota and the contributions of microbes to human health [1, 2]. These efforts are complementary to the numerous reports describing health benefits associated with the ingestion of probiotic bacteria [3, 4]. Probiotics are living microorganisms which confer health effects on the host when administered in sufficient amounts . Strains of Lactobacillus and Bifidobacterium are the most commonly applied probiotics in food products. Members of these genera are residents of the human intestine and have a long history of safe use in foods and beverages. Health benefits conferred by probiotics can be specific to the gastrointestinal tract (e.g. protection against intestinal inflammation or enteric pathogens) or occur at peripheral mucosal sites in the human body (e.g. prevention of allergy or dermatitis) . There is substantial evidence that an important mechanism by which probiotics provide health benefits is through modulation of immune functions [7–11]. Differences among probiotic strains to stimulate immune cells towards pro- and anti-inflammatory responses have been shown in studies measuring cytokine production in vitro[7–11]. These comparisons have resulted in the identification of strains inducing similar responses in vivo. For example, ratios of IL-10 to IL-12 produced by Peripheral Blood Mononuclear Cells (PBMCs) in response to different probiotics in vitro were correlated to their protective capacity in a mouse model of colitis . Similarly, recent studies on the mechanisms of probiotics highlight their effects on epithelial barrier function via Toll-like receptor 2 signaling and the generation of regulatory dendritic cells and regulatory CD4+Foxp3+ T cells in peripheral tissues [12, 13]. The latter mechanism is linked to the administration of a collection of five strains which induced a high IL-10/IL-12 ratio in co-culture with immune cells . Administration of these strains was shown to have a therapeutic effect in experimental mouse models of inflammatory bowel disease, atopic dermatitis, and rheumatoid arthritis and was associated with enrichment of CD4(+)Foxp3(+) Tregs in the inflamed regions . The cell products of probiotics that are responsible for modulation of cytokine induction are largely not known but might involve modifications of some of the known Microbe Associated Molecular Patterns (MAMPs) such lipoteichoic acids (LTA) [14–16] and (lipo)proteins localized on the bacterial cell surface  which interact with Toll-like receptors. Additionally cell-surface associated bacterial glycosylated proteins or exopolysaccharides  may interact with other host pattern recognition receptors including the C-type lectins and scavenger receptors found on antigen presenting cells . These extracellular and secreted products produced by probiotic cells are the likely targets for strain-dependent interactions with host cells and have been the focus of several recent reviews [6, 20, 21]. Certain strains of Lactobacillus plantarum are marketed as probiotics and reported to confer various health effects including immunomodulation . The genome sequence of L. plantarum strain WCFS1 is known  and extensive bioinformatics tools [24, 25], molecular models , and a database of genome hybridization profiles [27, 28] are available for this organism. It is a single colony isolate of strain NCIMB8826, which was shown to survive gastrointestinal passage after oral administration to healthy volunteers . Global gene expression profiling of L. plantarum WCFS1 in the intestinal contents of the human gut and conventionally-raised and germ-free mice has shown that this organism adapts for growth in vivo by modification of its cell-surface composition and metabolism in a diet-dependent manner [30–34]. Human duodenal transcriptional response profiles have also been obtained in response to ingestion of L. plantarum WCFS1 [35, 36]. Notably, exponential phase and stationary phase L. plantarum WCFS1 cells elicited distinct human duodenal transcript profiles which appeared to mainly result from differential modulation of canonical NF-κβ-dependent signaling pathways associated with immune tolerance . The aim of the present study was to identify genes involved in immunomodulation by L. plantarum WCFS1. The IL-10 and IL-12 cytokine levels elicited by peripheral blood mononuclear cells (PBMCs) upon stimulation with L. plantarum WCFS1 and 41 other Lactobacillus plantarum strains were determined. We compared the IL-10 and IL-12 stimulating phenotypes of each strain to its genome composition determined by comparative genome hybridization (CGH) to identify candidate L. plantarum genes with the capacity to affect cytokine production in PBMCs. The immunomodulatory potential of these gene products was confirmed for L. plantarum WCFS1 gene deletion mutants and found to be dependent on the growth-phase of the L. plantarum cultures. A total of 42 L. plantarum strains from distinct (fermented) food, environmental, and gastrointestinal sources (Table 1 and [27, 28]) were investigated for their capacities to stimulate PBMCs to produce the cytokines IL-10 and IL-12. Comparisons of cytokine amounts induced among different donors in response to the L. plantarum strains showed that the L. plantarum cultures induced a similar range of IL-10 but up to 10-fold different levels of IL-12 (Figure 1). This result is agreement with previous studies showing that PBMCs respond differently depending on the donor from which the cells were isolated . However, the capacity of individual L. plantarum strains to induce cytokines production in PBMCs was similar among the different donors relative to the other strains tested. For example, L. plantarum KOG18 consistently induced the highest amounts of IL-12 whereas strain CIP104448 induced the highest ratios of IL-10 to IL-12. Collectively, the 42 L. plantarum strains induced, on average, IL-10 and IL-12 in PBMCs over a 14- and 16 - fold range, respectively, and IL-10/IL-12 ratios over a 13.5 - fold range (Figure 1). Strain WCFS1 induced relatively low IL-10 amounts (between 440 and 780 pg/ml), moderate amounts of IL-12 (between 20 and 260 pg/ml), and consequently a moderate to low IL-10/IL-12 ratio (bottom quartiles) compared with the other strains (Figure 1). L. plantarum strains selected for genotyping and screening for immunomodulatory capacity. a See references [27, 28] for comparative genome hybridization analyses of these strains. Cytokine secretion by PBMCs after 24 h co-culture with L. plantarum strains. IL-10 (A) and IL-12 (B) production and the IL-10/IL-12 ratio (C) by peripheral blood mononuclear cells (PBMCs) derived from blood of 3 different healthy donors after stimulation with 42 different L. plantarum strains harvested in stationary-phase. The L. plantarum strains grown and prepared on separate days constitute set 1 and set 2. PBMCs isolated from donor A were inoculated with L. plantarum culture set 1 (A-1) and PBMCs from donor B were inoculated with the L. plantarum replicate set 2 (B-2). PBMCs from Donor C received both sets of cultures and the mean of the IL-10 and IL-12 amounts induced by these cultures is shown. Each symbol represents a different L. plantarum strain or the PBS or LPS controls. To identify candidate L. plantarum genes involved in the modulation of the immune response, Random Forest models  were used to compare L. plantarum CGH profiles with the relative amounts of IL-10 and IL-12 and IL-10/IL-12 ratios induced by the strains in co-culture with PBMCs (Figure 1). PBMCs from different donors incubated with replicate L. plantarum cultures were used for these models to take into account the levels of variation in cytokine production. Comparisons of L. plantarum strain genotype to the IL-10-stimulating capacities resulted in the identification of 6 different chromosomal loci and a total of 13 genes that might influence IL-10 production (Table 2). In comparison, concise correlations between L. plantarum CGH profiles and IL-12 amounts were not found. One of the genes correlated with IL-10 amounts was L. plantarum WCFS1 lp_1953. L. plantarum strains harboring this gene stimulated the production of IL-10 in 1.6-fold higher amounts, on average, compared to L. plantarum strains for which this gene was absent. Lp_1953 encodes a hypothetical intracellular protein of unknown function . The remaining five genes with putative roles in IL-10 modulation comprise a putative 5 gene operon (lp_2647 to lp_2651) encoding Pts19ADCBR, an N-acetyl-galactosamine/glucosamine phosphotransferase system (PTS). Strains harboring these genes were associated with induction of lower amounts of IL-10 by PBMCs. L. plantarum genes with putative roles in modulating PBMC cytokine production. a Gene number on the L. plantarum WCFS1 chromosome . b Percentage of L. plantarum strains containing the gene according to CGH [27, 28]. c Gene-trait matching importance measures (in parentheses) and predicted effects of the gene(s) on the variable and average magnitude and direction (higher or lower) of IL-10 and IL-10/IL-12 amounts. 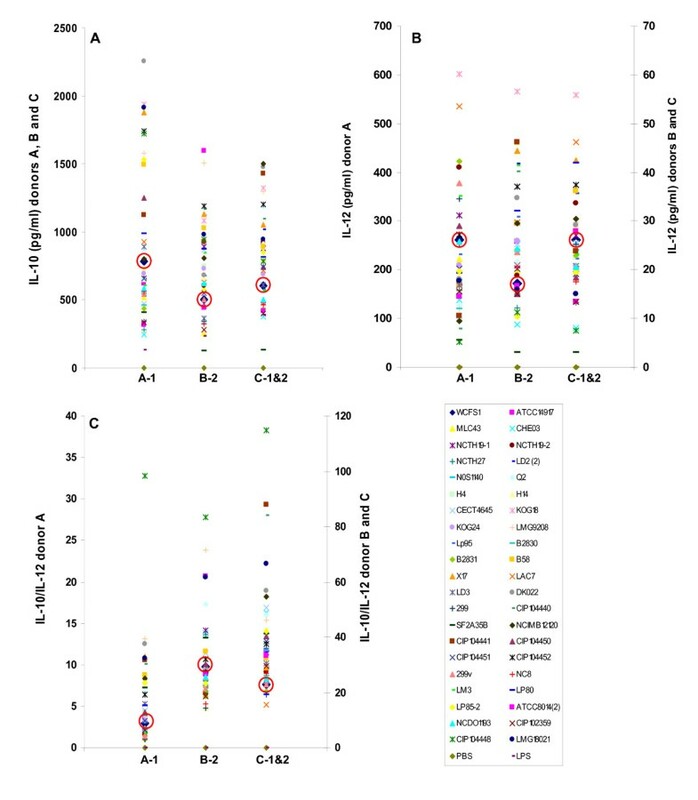 Comparisons between L. plantarum strain-specific CGH profiles and IL-10/IL-12 ratios from PBMCs resulted in the identification of four L. plantarum WCFS1 loci which correlated with IL-10/IL-12 values (Table 2). L. plantarum WCFS1 plnEFI and plnG (lp_419-423) and lamB (lp_3582) were most commonly present in strains stimulating low IL-10/IL-12 ratios. These genes are under the control of the auto-inducing peptide (AIP)-based quorum sensing (QS) two-component regulatory systems (QS-TCSs) found in L. plantarum[39, 40]. The genes plnEFI and plnG encode two bacteriocin peptides, a bacteriocin immunity protein, and an ATP - Binding Cassette (ABC) transporter [23, 41]. The lamB is the first gene in the L. plantarum lamBDCA operon and shows 30% amino acid identity to the S. aureus AgrD-processing protein AgrB required for AIP modification and export . The other L. plantarum genes associated with specific IL-10/IL-12 ratios are lp_2460 and lp_2480 coding for prophage R-Lp3 remnant proteins P2b protein 21 and 1, respectively . These genes are conserved among L. plantarum strains stimulating high IL-10/IL-12 ratios in PBMCs. The functions of prophage R-Lp3 and other complete prophages in L. plantarum WCFS1 genome are not known . Because the different prophages found in L. plantarum WCFS1 share high levels of sequence homology and potential functional redundancy , these genes were not examined further. To validate the influence of the candidate L. plantarum genes on PBMC cytokine responses, lp_1953, pts19ADCBR, plnEFI, and plnG deletion mutants were constructed for L. plantarum WCFS1. A previously constructed L. plantarum WCFS1 lamA (lp_3580)lamR (lp_3087) double mutant was used to examine the potential roles of the lamBCDA QS-TCS on PBMCs. This strain was selected because lamA and lamR encode the response regulators of the 2 TCS (lamBCDA and lamKR) regulating the expression of the LamD AIP in L. plantarum WCFS1 . In the ΔlamA ΔlamR mutant, expression levels of lamB and the other genes in this operon were at 5% of the levels found in wild-type cells . Wild-type and mutant L. plantarum WCFS1 cells harvested in the stationary- and exponential phases of growth were examined for their capacity to stimulate IL-10 and IL-12 in PBMCs. Overall, among the donors examined, IL-10 and IL-12 were produced in response to L. plantarum at levels between 500 to 4500 pg/ml and 3 to 68 pg/ml, respectively (shown as log2 values in Figure 2 and 3). Notably, exponential cultures of wild-type L. plantarum WCFS1 and most mutant strains stimulated PBMCs to secrete higher amounts of IL-10 and IL-12 than stationary-phase cells (Figure 2 and 3). Boxplots of IL-10 amounts produced by PBMCs in response to L. plantarum wild-type and mutant cells. 2Log transformed IL-10 amounts induced by exponential and stationary phase L. plantarum cells are shown. The dots indicate the median value, the boxes indicate first and third quartile, and the whiskers extend to outlying data points for a total of 12 measurements (3 PBMC donors were measured using 4 replicate cultures of each L. plantarum strain). Boxplots of IL-12 amounts produced by PBMCs in response to L. plantarum wild-type and mutant cells. 2Log transformed IL-12 amounts induced by exponential and stationary phase L. plantarum cells are shown. The dots indicate the median value, the boxes indicate first and third quartile, and the whiskers extend to outlying data points for a total of 12 measurements (3 PBMC donors were measured using 4 replicate cultures of each L. plantarum strain). L. plantarum strains harboring the plnEFI, plnG or lamB loci were associated with the stimulation of lower IL-10/IL-12 ratios by L. plantarum in the PBMC assay (Table 2). In agreement with the gene-trait correlations, the plnEFI, plnG, and lamA lamR deletion mutants of strain WCFS1 induced higher IL-10/IL-12 ratios than the wild-type strain (Figure 4 and Table 3). However, the effects of the plnEFI deletion on cytokine induction in different donors was not highly significant compared to wild-type L. plantarum when the p value was adjusted for multiple hypothesis testing (adjusted (adj.) p value = 0.071) (Figure 4 and Table 3). Mutants deficient in the ABC- transporter plnG induced significantly higher cytokine ratios compared with L. plantarum wild-type cells (Figure 4 and Table 3). These differences were observed only for wild-type and mutant cells harvested during exponential phase growth (adj. p value = 0.005). Immunomodulation of the ΔlamA ΔlamR mutant was also substantially different compared to wild-type L. plantarum WCFS1. The ΔlamA ΔlamR mutant induced significantly higher IL-10/IL-12 ratios (adj. p value = 0.016) and IL-12 (adj. p value < 0.001) and IL-10 (adj. p value < 0.001) amounts in PBMCs (Table 3). These effects were partially dependent on the growth-phase of the L. plantarum cells. IL-10/IL-12 ratios and IL-10 amounts induced by wild-type and mutant cells were significantly different when exponential phase cultures were used in the PBMC assay, whereas IL-10 and IL-12 amounts also differed when stationary-phase cells were examined (Figure 2, 3, 4 and Table 3). Boxplots of IL-10/IL-12 amounts produced by PBMCs in response to L. plantarum wild-type and mutant cells. 2Log transformed IL-10/IL -12 ratios induced by exponential and stationary phase L. plantarum cells are shown. The dots indicate the median value, the boxes indicate first and third quartile, and the whiskers extend to outlying data points for a total of 12 measurements (3 PBMC donors were measured using 4 replicate cultures of each L. plantarum strain). Relative differences in cytokine amounts between L. plantarum WCFS1 wild-type and deletion mutants. a L. plantarum WCFS1 deletion mutant measured in the PBMC assay. b Phase of growth from which L. plantarum cells were harvested (log = exponential phase; stat = stationary phase). c The value is the average difference in 2Log cytokine amounts induced by wild-type L. plantarum and mutant cells harvested in the same phase of growth (log or stat). A positive value indicates an increase in IL-10 levels produced by PBMCs in response to mutant L. plantarum compared to the wild-type cells. Calculations of t-test p-values and adjusted (adj.) p-values are described in the text (Materials and Methods). * (0.01 < p < 0.05); ** (0.002 < p < 0.01); *** (p < 0.002) for the adj. p-values. In agreement with the gene trait matching correlations, the Δpst19ADCBR mutant induced significantly higher amounts of IL-10 than wild-type L. plantarum (adj. p value = 0.031) (Figure 2 and Table 3). Similarly, the IL-10/IL-12 ratio was significantly higher (p < 0.001) upon stimulation with L. plantarum Δpst19ADCBR compared with the parental strain (Figure 4 and Table 3). L. plantarum strains harboring lp_1953 were also predicted to induce higher IL-10 production levels compared with strains lacking this gene. However, the L. plantarum lp_1953 deletion mutant stimulated equivalent amounts of IL-10 and somewhat higher IL-10/IL -12 ratios (adj. p value = 0.024) relative to wild-type L. plantarum WCFS1 (Figure 4 and Table 3). Although the lp_1953 mutant induces a modest, yet significantly different, IL-10/IL-12 response relative to the parental strain, these results are not in agreement with the immunomodulatory effects predicted for this gene. In summary, of the 5 mutants tested here, three (ΔlamA ΔlamR, Δpst19ADCBR, and ΔplnG) significantly affected the immune response of PBMCs in different donors according to the phenotypes predicted from the gene-trait matching data (Table 2). The plnEFI mutant also affected the immune response in the predicted manner but this was not significant considering the adjusted p value. The ΔlamA ΔlamR mutant conferred the largest differences on the induction of IL-10 and IL-12 and the IL-10/IL-12 ratio by L. plantarum (Table 3). This study demonstrated the diverse capacities of L. plantarum strains to stimulate cytokine production in human PBMCs and confirmed the contributions of specific L. plantarum genes to modulate these responses. Forty-two L. plantarum strains induced PBMCs to secrete IL-10 over an average 14-fold range. This range was similar to IL-10 amounts stimulated by 7 Bifidobacterium longum strains  and the 10 to 15-fold differences in cytokine amounts induced in PBMCs by multiple Lactobacillus and Bifidobacterium species [7–11]. Moreover, we found that variation in IL-10 and IL-12 amounts and IL-10/IL-12 ratios induced by the distinct L. plantarum strains was higher than reported previously . This result was probably due to the analysis of more strains in the present study (42 versus 3), which were isolated from diverse environmental niches encompassing a greater genetic and phenotypic diversity of the L. plantarum species. Such strain-specific differences should therefore be taken into consideration when selecting a probiotic Lactobacillus culture for health conditions which are dependent on modulating immunity such as in the prevention of allergy, eczema, or inflammatory bowel disease. To identify L. plantarum genes with roles in modulating immune cell responses, L. plantarum genetic diversity was correlated with strain-specific capacities to induce cytokines in PBMCs. Genes with putative contributions to the observed PBMC responses were further investigated in L. plantarum WCFS1. A similar gene-trait matching approach previously resulted in the identification of a L. plantarum mannose-specific adhesin (Msa)  and genes which modulate dendritic cell responses . Although the gene-trait matching approach has been successful, it should be recognized that only a subset of immunomodulatory cell components produced by L. plantarum was likely identified here. Firstly, the identified immunomodulatory genetic loci were restricted to genes in the L. plantarum WCFS1 reference strain genome. Secondly, genes with high levels of sequence conservation such that they are not distinguished by CGH (presence versus absence, rather than minor sequence variations) might be excluded from detection. For example, L. plantarum highly conserved LTA biosynthesis and modification genes known to have established effects on mammalian immunity were not found in this biodiversity-based gene-trait matching approach. Finally, genetic assessments do not take into account strain-specific variations in gene expression, translation, or post-translational modification of proteins with immunomodulatory effects. Despite these limitations and the considerable variation in the production of cytokines by PBMCs from different donors, the present study demonstrated that gene-trait matching is also suitable for the identification of genes that affect cytokine levels in the mixture of immune cells collectively termed PBMCs. The products of AIP-based QS-TCSs and the N-acetyl-galactosamine/glucosamine phosphotransferase system identified here might constitute a new class of bacterial cell products which are recognized by host receptors. The findings are significant because these genes were identified using intact cells which likely have multiple interactions with immune cells such that single genes only confer incremental effects. L. plantarum WCFS1 lamB, a processing/export protein of the AIP-based QS-TCS LamBDCA , was correlated with immunomodulation of PBMCs. LamB, a transmembrane protein, is under the control of two response regulators lamA and lamR. A L. plantarum ΔlamA ΔlamR mutant investigated in this study was found to induce PBMCs to secrete significantly higher amounts of the cytokines IL-10 and IL-12. In a previous report, global transcript profiling of the lamA lamR deletion mutant showed that the lamBDCA system is auto-regulated and controls the production of several surface-associated proteins, stress-associated functions, and surface polysaccharides . Higher amounts of surface polysaccharides produced by L. plantarum ΔlamA ΔlamR decreased the biofilm-forming capacity of the mutant strain . Polysaccharides produced by some Lactobacillus species are known for their immunomodulatory effects either by direct interactions with immune cells or by shielding MAMPs on the bacterial cell surface from detection by the immune system [18, 48, 49]. Therefore the observed PBMC IL-10/IL-12 ratios for L. plantarum might either be mediated directly through the LamBDCA system and the cognate secreted peptide, or indirectly through cell products (e.g., polysaccharides) under the control of this regulatory system. The latter is supported by the genetic similarities between LamBDCA and the Staphylococcus aureus agr system, an AIP-based QS-TCS which controls the evasion of innate host defenses by S. aureus through the production of secreted peptides and proteases . The plantaricin biosynthesis pathway of L. plantarum WCFS1 is also controlled by an AIP-based QS-TCS  and genes required for plantaricin production and transport contributed to L. plantarum effects on PBMCs. Plantaricin is a bacteriocin composed of two small secreted peptides (plnE and plnF) which destabilize the integrity of the plasma membrane of susceptible cells . L. plantarum strains harboring plnEF and plnI encoding a plantaricin immunity protein, and/or plnG encoding a membrane bound ABC-transporter induced PBMCs to secrete IL-10 and IL-12 in amounts that yielded lower IL -10/IL-12 ratios (Table 2). Similarly, wild-type L. plantarum WCFS1 conferred lower IL-10/IL-12 ratios compared to the plnEFI and plnG deletion mutants, although this was significant only for the plnG mutant (p = 0.005) and not the mutant lacking plnEFI (p = 0.071). The identification of the AIP plantaricin is intriguing because human antimicrobial peptides such as defensins secreted in the gut are known to modulate immune responses [52, 53] and suggest that antimicrobial peptides of bacterial origin might have similar capacities. These findings are also compatible with a recent study showing that plantaracins can modulate dendritic cell responses . Moreover, several independent studies showed that L. plantarum WCFS1 genes involved plantaricin biosynthesis and activity, including plnI and plnF, are induced in the mouse gut [30–32], thereby indicating that plantaricin production is active in the intestine where it might come into contact with mucosal immune cells. Another of the confirmed genes with immunomodulatory capacities was the pts19ADCBR locus coding for a cell membrane-associated N-acetyl-galactosamine/glucosamine phosphotransferase system. The relevance of the pts19ADCBR genes in adaptation to the intestinal ecosystem was also demonstrated by their higher expression levels in the intestine of conventionally-raised and germ-free mice [31, 32]. Moreover, in Lactobacillus johnsonii, a putative mannose phosphotransferase gene locus with 43% amino acid identity to the L. plantarum WCFS1 pts19ADCBR cluster was found to be important for long term persistence in vivo. Although the regulatory signals for expression of these genes are unknown, immunomodulatory effects conferred by Pts19ADCBR might influence the ability of L. plantarum to modify the intestinal environment for survival in the gut. Cytokine profiles of the lp_1953 deletion mutant were not in agreement with the IL-10 stimulating capacity predicted for this gene by gene-trait matching. This result exemplifies the need for mutation analysis to confirm gene-trait predictions, which are likely to encompass false-positive associations. A similar conclusion was drawn during the identification of the L. plantarum Msa gene . Moreover, the product of lp_1953 is predicted to be intracellular, which contrasts the predicted subcellular location of all other genes examined here (secreted or cell envelope associated) [24, 25]. This finding supports the notion that surface-localized proteins or components are the most likely candidate-participants in host-microbe interactions [49, 55]. Thus far, the majority of the known immunomodulating MAMPs known for lactobacilli are extracellular or cell surface associated products such as LTA, exopolysaccharides, and peptidoglycan, although intracellular CpG-containing oligodeoxynucleotides (ODNs) produced by some lactobacilli are able to induce IL-10 production in immune cells [21, 49]. These MAMPs are recognized by specific Pattern Recognition Receptors (PRRs) such as Toll-like receptors (TLRs) and nucleotide oligomerization domain (NOD)-like receptors . To identify the mechanisms underlying the effects of AIP-based QS-TCSs and the N-acetyl-galactosamine/glucosamine phosphotransferase system on immune cells, the cellular products encoded by the genes in these pathways should be investigated to identify the specific cell types among the PBMCs, which include lymphocytes, monocytes and macrophages, that recognize these compounds as well as the specific mechanisms leading to altered cytokine production. Comparisons of mutant and wild-type L. plantarum WCFS1 cells included examination of the effects of culture growth phase on the stimulation of PBMCs. Exponential- and stationary-phase L. plantarum WCFS1 cultures were evaluated because the growth phase of probiotic cells was previously shown to influence the immune responses to probiotic bacteria in vitro[56–59] and in vivo. Using human PBMCs, we found significant growth-phase dependent differences in the immunomodulatory capacities of the wild-type and mutant L. plantarum cultures. Collectively, the exponential-phase L. plantarum WCFS1 cultures stimulated higher absolute amounts of IL-10 and IL-12 and hence appear to induce heighted immune responses by PBMCs compared with stationary-phase cells. Notably, this result was not due to extensive L. plantarum growth because antibiotics were added to the PBMC growth medium to prevent bacterial overgrowth which would generate artifacts from acidification of the medium causing PBMC cell stress or death. Moreover, intact and lysed L. plantarum strains cells collected from the exponential and stationary phase of growth do not show striking differences in their TLR9 signaling activity and there was not a clear trend among all strains tested (personal observation, M. Meijerink and J. M. Wells). Therefore the higher amounts of cytokines induced by exponential phase bacteria are unlikely to be caused by differential cell lysis resulting in the release of intracellular CpG DNA, a known MAMP recognized by TLR9. Comparisons of wild-type and mutant L. plantarum cultures also showed growth-phase dependent effects. The IL-10 amounts and IL-10/IL-12 ratios induced by the pts19ADCBR deletion mutant were significantly different from wild-type L. plantarum WCFS1 for only the stationary-phase cultures. Stationary-phase cells of the ΔlamA ΔlamR mutant also induced significantly higher amounts of IL-10 and IL-12 in compared with L. plantarum WCFS1 harvested at the same growth phase. However, differences between IL-10/IL-12 ratios induced by ΔlamA ΔlamR and wild-type cell differed only for exponential phase cultures. This result might have been partially due to the extensive alterations in expression of L. plantarum ΔlamA ΔlamR in actively growing cultures , such that differences in expression of lamBDCA and lamKR regulated genes might have influenced the ability of the exponential-phase L. plantarum cells to stimulate different PBMC IL -10/IL -12 ratios. A similar result was found for the comparisons of L. plantarum plnG (and plnEFI), the other 2 TCS system examined, although the specific growth-phase-dependent modifications of the plantaricin system on cytokine production in PBMCs is not presently known. The present study compared the genetic and phenotypic diversity of L. plantarum WCFS1 to identify cell components of this species with the capacity to modulate human PBMC responses. We successfully identified several L. plantarum WCFS1 genes that are associated with the production of anti- and pro-inflammatory cytokines by PBMCs and established that the immune response to L. plantarum can be significantly altered by the deletion of specific L. plantarum cell surface proteins. The increased IL-10/IL-12 ratios of the L. plantarum mutants indicate that these cultures would be more protective against intestinal inflammation compared with wild-type cells. These effects might be mediated by the down-regulation of local inflammatory responses through various subsets of T cells producing a collection anti-inflammatory cytokines. As a result of this study, strain selection for protection against intestinal inflammation might include screening for strains lacking the LamB, PlnG, or Pts19 homologs or by modifying culture growth conditions or food delivery matrices to minimize the expression of these genes in vivo. Such studies are required to distinguish between health effects conferred by individual probiotic strains and to develop methods to ensure that probiotic cells express host-modulatory cell products at the appropriate level and time in food products and the human gut. Immune assays and genetic analysis was performed on a total of 42 L. plantarum strains with distinct phenotypic profiles [27, 28] (Table 1). Comparative genome hybridization (CGH) of these strains was performed previously [27, 28]. For immunoprofiling, the L. plantarum strains were grown at 37°C in Mann-Rogusa Sharpe (MRS) broth (Merck, Darmstadt, Germany) until mid-exponential (optical density (OD) 600 nm = 1) phase or stationary phase (24 h after the start of the culture, OD600 nm = 7.6 ± 1.1) . The exponential and stationary phase cells were washed twice in phosphate buffered saline (PBS) at pH 7.4, suspended at 2 × 108 cells/ml in PBS containing 20% glycerol, and stored at -80°C until co-culturing with human immune cells. Quantification of the exponential and stationary phase viable cells before and after freezing showed no significant losses in cell viability (data not shown). Colony forming units (CFUs) were determined by plating serial dilutions of the cultures on MRS agar (data not shown). This study was approved by Wageningen University Ethical Committee and was performed according to the principles of the Declaration of Helsinki. Peripheral blood of healthy donors was from the Sanquin Blood Bank, Nijmegen, The Netherlands. Before sample collection, a written informed consent was provided. Peripheral blood mononuclear cells (PBMCs) were separated from the blood of healthy donors using Ficoll-Paque Plus gradient centrifugation according to the manufacturer's protocol (Amersham biosciences, Uppsala, Sweden). After centrifugation the mononuclear cells were collected, washed in Iscove's Modified Dulbecco's Medium (IMDM) + glutamax (Invitrogen, Breda, The Netherlands) and adjusted to 1 × 106 cells/ml in IMDM + glutamax supplemented with penicillin (100 U/ml) (Invitrogen), streptomycin (100 μg/ml) (Invitrogen), and 1% human AB serum (Lonza, Basel, Switzerland). PBMCs (1 × 106 cells/well) were seeded in 48-well tissue culture plates. After an overnight rest at 37°C in 5% CO2, 5 μl aliquots of thawed bacterial suspensions at 2 × 108 CFU/ml were added to the PBMCs (L. plantarum: PBMC ratio of 1:1). PBS (5 μl) and LPS (1 μg) served as negative (PBS) and positive (LPS, TLR4 ligand) controls for the stimulation of PBMCs. IL-10 was produced in sufficient amounts for quantification in response to LPS but not to PBS. Similarly, neither LPS nor the PBS buffer stimulated the production of IL-12. To test the capacity of the 42 L. plantarum strains to stimulate PBMC cytokine production, PBMCs from 3 different donors were examined (donors A, B, and C). 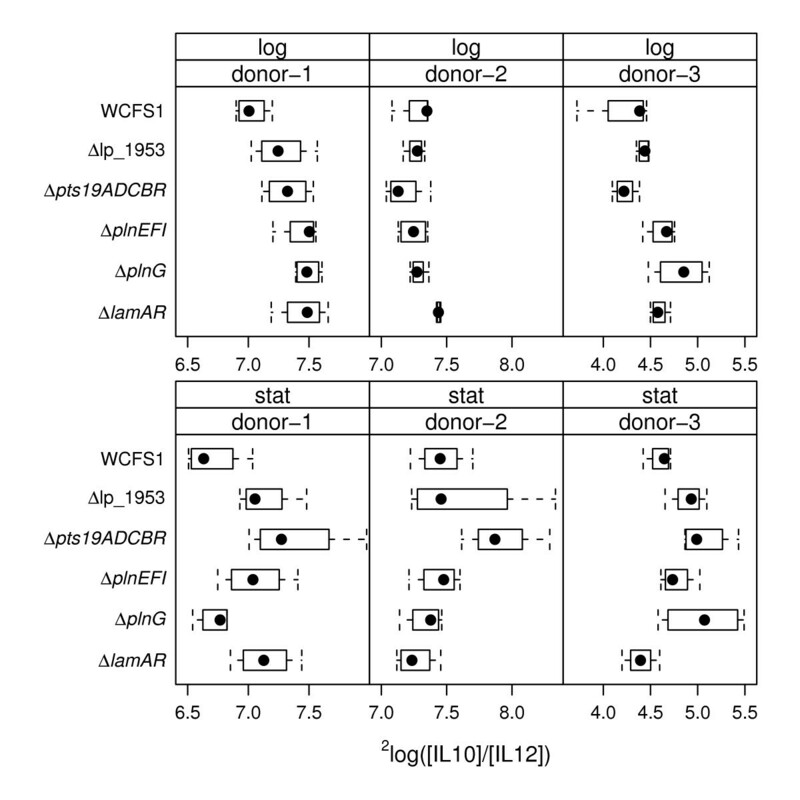 For donors A and B, separate stationary-phase cultures of each L. plantarum strain were used. For donor C, both replicate cultures of each L. plantarum strain were examined. In PBMC assays comparing responses to L. plantarum WCFS1 wild-type and mutant strains, PBMCs from 3 different donors were examined using 4 independent replicate wild-type and mutant L. plantarum cultures harvested during exponential-phase and stationary-phase of growth. Following 24 hr incubation at 37°C in 5% CO2, culture supernatants were collected and stored at -20°C until cytokine analysis. This time point was selected for analysis because previous studies showed that IL-12 levels remain unaltered after 4 days of L. plantarum incubation with PBMCs. Although IL-10 was shown to increase 2- fold after 4 days of co-incubation with L. plantarum, sufficient cytokine amounts were produced after 24 h to permit flow cytometric measurements . No viable bacteria could be cultured and medium acidification was not observed after incubation of L. plantarum strains with the PBMCs for 24 h (data not shown). Cytokines were measured using a FACS CantoII flow cytometer (BD Biosciences, Franklin Lakes, New Jersey) and BD Cytometric Bead Array Flexsets (BD Biosciences) for interleukin (IL)-10 and IL-12p70 (henceforth referred to as IL-12) according to the manufacturer's recommendations. Detection limits were 0.13 and 0.6 pg/ml for IL-10 and IL-12 respectively. Concentrations of analytes were calculated with the use of known standards and plotting the sample values against a standard curve in the BD Biosciences FCAP software. Donor-specific variation in cytokine production capacities was taken into account by dividing the cytokine amounts induced by individual L. plantarum strains against average cytokine quantities induced by all L. plantarum strains for the same donor. These values were then compared to amounts induced by L. plantarum WCFS1 and used for gene-trait matching. L. plantarum genes with potential roles in modulating of PBMC cytokine production were identified by in silico matching using genotype information referenced from the L. plantarum WCFS1 genome (also termed gene-trait matching) . Individual L. plantarum WCFS1 gene presence or absence scores for the 42 strains were used as putative predictor variables for PBMC induced IL-10, IL-12 and IL-10/IL-12 amounts by regression using the Random Forest algorithm . The "RandomForest" package for R  was used with standard parameter settings. L. plantarum WCFS1 genes with the highest variable importance measures by the Random Forest method were selected for deletion analysis. A previously described L. plantarum ΔlamA ΔlamR mutant was used in this study . Construction of L. plantarum lp_1953, lp_2647-2651, lp_0419-0422 and lp_0423 gene deletion mutants was performed as previously described  with several modifications. The mutagenesis vectors were generated by a splicing by overlap extension (SOE) procedure . This procedure was designed to expedite mutagenesis vector construction for L. plantarum using a single step, blunt-ended cloning and positive selection for transformants based on chloramphenicol resistance. PCR was used to amplify approximately 1 kb of the 5' and 3' regions flanking the genes targeted for deletion (for primer sequences see Table 4). In addition, the loxP-cat-loxP region of pNZ5319 was amplified using primers Ecl-loxR and Pml-loxF (Table 4). For each mutagenesis vector, the amplicons representing the corresponding 2 flanking regions and the loxP-cat-loxP region were mixed in a 1:1:1 molar ratio and used as template in a second PCR reaction with the 5'forward and 3'reverse flanking primers. These PCR reactions resulted in 3 kb amplicons which were cloned into the integration vector pNZ5319  after prior digestion of the vector with SwaI and Ecl136II. Plasmids were transformed into competent cells of E. coli JM109 by electroporation as recommended by the manufacturer (Invitrogen). Plasmid DNA was isolated from E. coli using Jetstar columns (Genomed GmbH, Bad Oeynhausen, Germany) using the manufacturer's recommended protocol. DNA sequencing (BaseClear, Leiden, The Netherlands) was performed to confirm the integrity of the cloned genes. The resulting plasmids containing the complete gene replacement cassettes were used for mutagenesis . a Bold and underlined nucleotides signify overlapping ends with the Ecl-loxR and Pml-loxF primers. Linear mixed effect models using restricted maximum likelihood (REML) were used to statistically compare the mean cytokine values of IL-10, IL-12, and IL-10/IL-12 produced in response to L. plantarum wild-type and mutant cells. The effect of the donor on the response variable was modeled as a random effect. The fixed effects in the model were the strains (WCFS1 [wild type], Δpts19ADCBR, Δlp_1953, ΔplnG, ΔplnEFI, and ΔlamA ΔlamR) and the growth phase at the time of harvest (exponential phase and stationary phase). Logarithmic transformations of [IL-10], [IL-12] and [IL-10]/[IL-12] yielded residuals that showed approximately normal distributions (data not shown) and, hence, were used as the response variables in the fitting procedure. Statistical analysis was performed using R http://www.r-project.org, with the package "nlme"  for mixed effect modeling. The donor random effect was modeled as a constant offset relative to the average level of the response variable ("model 1"), or alternatively, as a donor-dependent offset plus a donor-dependent variation in the effect of the bacterial growth phase on the response variable ("model 2"). Model 2 yielded better fits for 2log([IL-10]) and 2log([IL-10]/[IL-12]) response variables whereas, indications of a donor dependent variation in growth phase effects were not found for the 2log([IL-12]) response, and hence model 1 was applied for comparison of these cytokine amounts. The resulting relative difference coefficients and t tests were calculated from the fixed effects (mutation, growth phase, and their interaction) using analysis of variance in R. The p-values were adjusted for multiple hypothesis testing using the correction procedures by Hochberg . We would like to thank Nico Taverne for his assistance with the immune assays. This work was funded by TI Food & Nutrition, Wageningen, The Netherlands. SvH performed the PBMC assays, constructed the deletion mutants and prepared the manuscript. MM assisted with isolation of PBMCs and flow cytometry for cytokine analysis. DM performed the statistical analysis and gene-trait matching. PB designed the mutagenesis strategy. PdV coordinated the research groups involved in the study and assisted in data interpretation and analysis. MK assisted with the design of the study and help draft the manuscript. JMW helped draft the manuscript, assisted with the design of the study, and supervised a portion of the research. MLM designed the study, supervised a portion of the research, and prepared the manuscript. All authors read and approved the final manuscript.